'Jordana' (Robert W. Wallace, 1913). Section Oncocyclus; Early bloom season. Color Code-R7M or D; "A magnificent species, flower very large, 15 cm in diameter, maroon or rose-colored. Falls 5 cm, ovate, almost without haft, very closely lined with maroon or lilac; signal orbicular or nearly square, reddish-purple, 2.5 x 2 cm, beard dense, of long, yellow hairs on a white ground. Standards nearly orbicular, crenate, 7.5 cm, with a very short, narrow haft, veined with dark-purple on a white ground, and thickly dotted with minute, purple dots; style-branches much arched and keeled (some rarely with linear lobes projecting from the back), colored like the standards, crests subquadrate, with a serrated edge: filaments yellow shorter than the anthers, stamens much shorter than the crests. "- Flora of Syria, Palestine, and Sinai, revis. Dinsm. 2: 598. Beirut 1933. Wallace 1913. 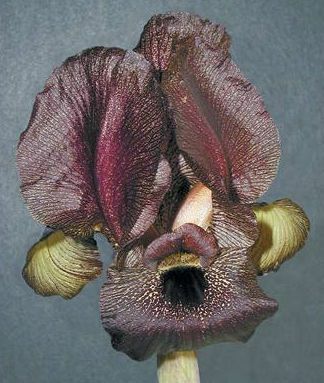 [Iris jordana now considered a group under Iris atrofusca by Naomi Feinbrun in Flora Palaestina 4: 1986].